This tutorial will review the restore procedure for a Loaded Commerce website. This may be required if you were making changes on your website and somehow it got corrupted. The first step is to restore the files of your Loaded Commerce website on the server. For that purpose, you first need to choose the location, where you need the backup restored. If you wish to restore your website and access it via the primary domain of your account, you need to upload the files to the public_html/ directory of your account. This may differ, depending on your restore preferences. The second step is to restore the database of your Loaded Commerce website. For that purpose, you need to create a new and empty database on your account that will be used for the restore. When you create your new database, it is time to import the backup to it. Simply log into your cPanel account and locate the Databases tab. Click on the phpMyAdmin icon to access the service. Select the newly created database from the list on the left-side of the screen. 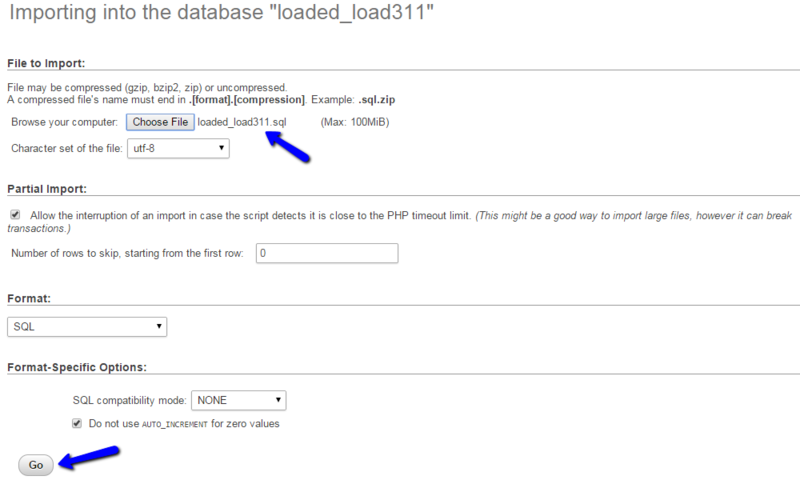 Select the database dump file from your local computer and click on the Go button to complete the import. Up until now, you will have a location on the server that contains all of the files of your Loaded Commerce backup and a database that contains the data for your website. To complete the restore process, you need to link them together. This is performed via the configuration file of your website. You need to edit it and set the new database details for your website, as well as the URL and file-paths that it will use. Note that this may differ from the previous configuration for your website, if you have decided that you wish to restore the backup on a different location. We have an excellent tutorial, which will provide more details on how to locate and edit the Loaded Commerce configuration file.